My family and I went to Newport, RI for a wedding, That weekend we walked the "Cliff Walk", we walked the water side of it, and then we looped around to the front where the gates are. 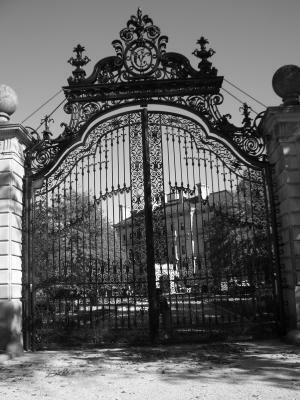 I am fascinated by the iron work with the gates that enclose the mansions. My mother-in-law and I were taking pictures right next to each other, and there was no one around except us. I took a picture of the gate and then I developed the film and brought them to work to show. I was taking a closer look at the iron work within the picture and noticed an outline of a small figure at the gate looking out. I told and showed my mother-in-law this picture and she remembered that she took the same photo, we looked at her developed pictures and there wasn't any figure in hers, so that's why I think it is a ghost/spirit. You know the part of the tour when you can look up the winding servants quarters? When I was there last year I saw the same little girl peering down in a night gown before walking away. I am an avid paranormal researcher... I go out on my own with friends and actually look for this kind of stuff. I have gotten some great pictures myself, but this one is great. I know the mansion you are talking about because I have family there and I myself have been there numerous times...Great pics. I have a site on Facebook called Mystic Paranormal Investigations with some pics if anyone would like to see them. Feel free. And again great picture. I've heard and saw strange things before but never been able to capture any photos. I thought ghosts, spirits or whatever you call it only appear at night or when it's dark. But it seems that it will show itself anywhere, anytime. I can see a figure behind the gate. Thank you for all the wonderful comments. I certinly did not have this one planned. and i didnt see it myself at first, when a co-worker of mine pointed it out i got instant chills, but i will be posting the comparasion picture soon, i have to get it from my mother- in law. i will be returning to newport soon so i will take another picture of the same gate so i will have double proof its not a fake. lol. Now, I'm not an expert, but I have seen things in my time. I'm not old nor am I a little one still, but this.. Is by far mind blowing. You can see the little boy perfectly peering through the gate, almost like he wants in. Its perfect. Great work, its difficult to catch them on sight. It looks like a little guy and a little girl right next to him, the boy's body is behind the gate, and his head is peaking around, the girl is right next to him, with her head leaning against him. Looking at the picture, the boy is on the left, and the girl is on the right.... I had to save, than zoom into the pic, but I can see it very well.. would love to see the comparison. Nice picture. I dont see anything. I read all the comments saying where they saw it. Nothing was there. It just looks like a plain picture of a gate. That is one of the most fantastic pics I have seen here yet! I enlarged it and brightened it up as much as I could, and it looks like a little girl wearing a long, period style dress with a shawl. Kam, this is an awesome picture of a spirit. I just love things like this and I am always looking for things like this. I love anything to do with spirits/ghosts. I've had one in my own home as you well know. So keep us informed as to any new "goings on". for all that cant see it. by: from the person that took the pic. If you look at the picture and look at the seam in the middle where the gates meet to close and open, look on the right hand side on the bottom look up about the first section of the gate, there is a figure there, looking like a small boy or girl. Look at the gate you don't see the boy or girl there hello look with your eyes open !!!!!!! Look right at the seam where the two gates meet, then look down... see the figure on the right gate??? I think you really caught a little boy there! I can't see anything in that picture. Interesting. having the validation of your Mom's photograph without the dark figure would surely make me wonder too.